Alfred Hitchcock's <i>Vertigo</i> Cameo: What is That Thing? Alfred Hitchcock's Vertigo Cameo: What is That Thing? View the entire cameo scene on YouTube. 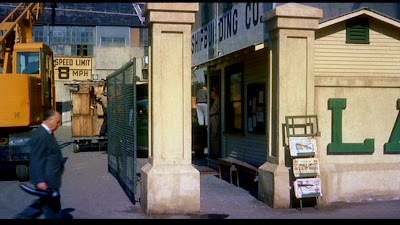 (Yep, you'll see James Stewart walking into the shipbuilding company office for his next scene. 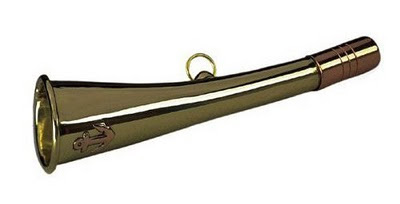 Since the invention of the steam-powered foghorn in 1825, almost all foghorns have been mechanically operated. That said, even today, sailors might keep a human-powered model like this on board as an emergency backup. As Ken notes on his November 6 blog post (you have to scroll down to find it), it is fitting that Hitch would be carrying a foghorn for his cameo in Vertigo. The San Francisco fog was as much a character in the film as the city itself. Unlike Hitch's earlier The Lodger: A Story of the London Fog (1926), which cast that city's fog in a menacing light, Vertigo plays San Francisco's mists in a minor, rather dolorous key. It sets a lonely, mysterious mood in which people mourn the loss of the past and where they may wander indefinitely like spirits. Regarding "Madeleine"'s grey suit, costume designer Edith Head recalled that Hitch wanted her "to look as if she just stepped out of the San Francisco fog – a woman of mystery and illusion." Hitch was prone to using musical instruments as props in his cameos. In ascending order, he carried a double-bass (Strangers on a Train), a cello (The Paradine Case) and a violin (Spellbound). In Rear Window, he showed up, naturally enough, in the composer's studio apartment, which is dominated by a baby grand piano. For a director who often compared his filmmaking approach to that of an orchestral composer, such visual juxtapositions were only natural. The foghorn he carried in Vertigo continued that pattern, while also adapting to the motifs of this particular movie. Of course, the foghorn case also reminds us that Hitch is the signal-master in his films. Yet, though he carries a seafarer's instrument, he's wearing a dark grey landlubber's suit. Hitch is not a sailor – he's the man the sailors work for. Not only does this establish his primacy in the film (after all, one of the beguiling aspects of his walk-ons is that he's both a character in the movie and a gate-crasher from behind the scenes; like a priest or shaman, he's in the film, but not of it), but it links him to the ship builder and evil mastermind Gavin Elster, who makes his appearance in the very next scene. *In his book Hitchcock as Philosopher, Robert J. Yanal suggests that it is a hunting-horn case, and theorizes that it refers to the medieval origins of the Tristan and Isolde myth in which the film's story has its origins. While he makes an interesting point (and the shape is similar), I think the connection is too abstruse and thus rather tenuous. **For an important find like this, I want to make sure everyone gets his due credit. The question was posed initially by Frank P. Tomasulo, Ph. D. on a discussion thread on Mubi.com, and Matt Parks observed that it is likely a manual foghorn. You are my god! This is fascinating. Vertigo isn't one of my favorites of Hitch's, but its subtleties are mesmerizing. Ha! Thanks much, Un-Pink Girl! I wanted to know if you've seen two interesting pieces of footage regarding hitch: one of him directing the strangulation scene in Frenzy. It's very eerie footage. Also, the rare footage shot for Kaliedoscope Frenzy. I've always wanted to see it and finally found it in this 2 part doc, torwards the end of part 2. Also interesting is a very bitter Tippi Hendren interview. I love the footage of Hitch directing. Not enough of that to go around! Thanks for sharing. Excellent! And further proves just how much I need to sharpen my eyes because I'd never noticed this detail before. And while in the end it probably is just a bit of fun I love your connection of his cameo to Elster's character. Yes - and just goes to show that Hitch's genius was hidden in plain sight!